Alaska's far northern tribes trade oil -- seal oil. Shiodome goes from bog to boomtown. But can it thrive? Green tea cafes are all the rage, and this one's got the leaves. Where Japan lost its way and how to get it back. Why do Cybirds Suddenly Appear? The migration path of a mobile Internet company. Japanese culture, language and color combine in a Hollywood blockbuster. Bandai has pricing power and is cranking for Christmas. The man behind the mother of all Japanese rock festivals. Can Kansai's heroes turn pennants into pennies? For 30 years, Dai Wakiyama has headed Japan's largest and oldest Private Detective Agency, I.I. Service Co. In 2000, I.I.S. launched D-Quest: the most aggressive risk management firm in Japan. Now, with international tie-ups and a bold new approach to corporate governance, D-Quest aims to become the nation's most innovative (and richest) corporate securities firm. The Japan Exchange and Teaching Program (JET) brings upwards of 5,000 foreigners into Japanese classrooms each year. Some of those foreigners are loathe to leave when their three years are finished. Marcus Chidgey profiles a happy handful who put solid stakes in the ground and set up entrepreneurial enterprises many miles from home. 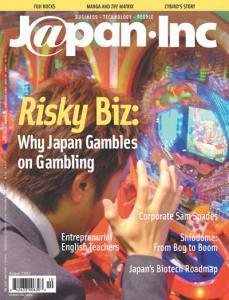 Pachinko is Japan's most ubiquitous form of gambling. It's also technically illegal and plagued by associations with organized crime. But as Tokyo governor Shintaro Ishihara and other notables push for casinos to boost Tokyo tourism, writer Tony McNicol pops into some parlors to see what the clatter is really all about. Motorboat races have the power to transform.